Guayusa is a caffeine- and antioxidant-rich leaf from Ecuador that is an excellent alternative to traditional sources of caffeine. Thanks to its unique biological makeup of caffeine and polyphenols, the brewed guayusa leaf provides sustained energy, mental clarity, and focus without feeling a crash. When used as a key ingredient as it is in RUNA energy drinks, guayusa offers as much caffeine as coffee and twice the antioxidants of green tea per serving without the bitter after-taste associated with some tea leaves. Polyphenols are a type of antioxidant, which help protect the body against oxidative stress. This protective effect is essential to healthy aging and helps reduce the risks of various forms of illness. Guayusa is a potent source of antioxidants and only raw cacao powder has more antioxidants than brewed guayusa. L’theanine (another compound naturally present in the guayusa leaf) is a type of amino acid that protects and repairs the brain and promotes relaxation. When combined with caffeine, it counteracts the jitters and increased heart rate often associated with caffeine, so you can enjoy a smooth energy lift without a crash. Guayusa is grown almost exclusively in the upper Amazon region of Ecuador, where the Andes Mountains meet the Amazon rainforest. This area is known to be one of the most biodiverse regions in the world. Guayusa and yerba mate are cousin plants. Guayusa is found primarily in the Ecuadorian Rainforest while yerba maté is from the Atlantic Rainforest. Both are naturally caffeinated and contain healthy polyphenols to offer sustained energy for consumers. However, guayusa leaves have lower levels of tannins which means it has a naturally sweeter and smoother taste than yerba mate. This also means that we don’t need to add as much sugar as similar yerba mate products for an enjoyable taste. Why do RUNA energy drinks taste different than before? RUNA is first and foremost about functionality -- a natural source of 'clean' energy without any of the artificiality of sugary energy drinks. We recently went through a series of flavor reformulations to make sure we’re offering the best tasting, natural energy drinks possible. RUNA is a Kichwa term that translates to “fully alive”. For the Kichwa people, it is a term of immense cultural importance. As a company, RUNA is committed to sharing the Kichwa’s rich cultural heritage with the global community. How long after I open a RUNA, is it safe to drink? We recommend you finish drinking your RUNA 24 hours after opening. I'm pregnant. Is RUNA safe to drink? Please consult your personal physician, who best understands your current health condition. Yes, RUNA is packaged in a recyclable aluminum can. Is RUNA Fair Trade certified? Yes, RUNA earned Fair Trade certification from Fair Trade USA in February 2012. 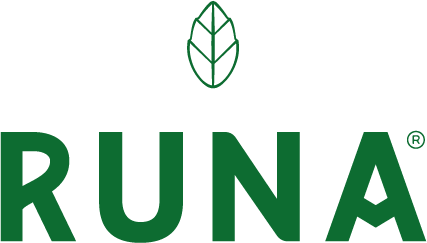 Yes, all RUNA products are certified non-GMO. Yes, all RUNA products are certified kosher.